Your Aurora, IL Dental Office! 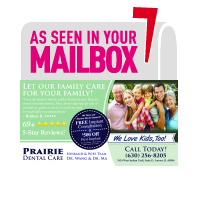 Welcome to Prairie Dental Care, the family dental office of Dr. Christine Wang and Dr. Xiaoyu Ma located in Aurora, Illinois. We look forward to welcoming you to our dental office. We know that getting personalized dental care can be a challenge in today’s corporate world. We are a private dental practice owned by a husband-and-wife team who values our patients deeply. We want you to have a true family experience while you are with us, and we are committed to giving each of you the same high level of care we want for our own family and friends. Dr. Wang and Dr. Ma just had their first child and know that it can be challenging for parents to get the quality dentistry they need for their family to stay healthy. We welcome everyone and proudly offer children’s dentistry in our office. We know that oral health changes as you age. From your kids and teens to your most senior family members, our dentists are experienced in protecting the oral health of everyone in your family - from toddlers to patients beyond their nineties. By approaching dentistry in a preventive way, we can help you avoid many common dental conditions. Our restorative dentistry can add stability and comfort to your smile. If you experience a dental emergency, we are here for you and can often treat you on the same day. We will strive to promptly restore your health and comfort. Our office proudly speaks Chinese (Mandarin and Cantonese) and Spanish, making quality dental care easy and accessible for our diverse community. By constantly attending continuing education courses and implementing the latest technology into our office, we keep the dentistry we provide on the leading edge of our field. We have hundreds of additional hours of training in procedures like dental implants and root canal therapy so we can treat you here in our office without needing a referral to a specialist in most cases. Do You Need a Family Dentist near Aurora, Illinois? Contact us to schedule your next dental appointment. We work with most insurance companies and offer flexible payment options to make getting dental care easy and convenient. All the dentistry we provide is designed to be long lasting, attractive, and comfortable. Your smile is important and we use high-quality materials, techniques, and our experience to give you great results and a smile you'll feel proud of. From fillings to crowns and cosmetic dentistry, we strive to exceed your expectations in every way. We treat our patients with respect and honesty because we value your trust and enjoy developing long-term relationships by understanding your needs and goals for your smile. We will never rush you through treatment or pressure you into dentistry you are unsure about. We strive to diagnose, educate, and provide solutions to keep your smile looking and feeling great.